The nutritional quality of Artemia biomass produced in semi-intensive or super-intensive systems is analogous to natural produced biomass except for the lipid content. The protein content of ongrown Artemia, independent of its rearing conditions or food, is appreciably higher than for instar I-nauplii (Table 4.4.1.) and is especially richer in essential amino acids (Table 4.4.2.). On the other hand the lipid profile, quantitatively (Table 4.4.2.) as well as qualitatively, is variable and a reflection of the diet offered to the Artemia cultures. This does not necessarily restrict their application since high levels of essential fatty acids can easily and very quickly be attained in the Artemia biomass by applying simple bio-encapsulation; in less than one hour the digestive tract of the brine shrimp can be filled with a HUFA enrichment product, boosting the (n-3) HUFA content from a low level of 3 mg.g-1 DW up to levels of more than 50 mg.g-1 (see 4.4.2.7.). Artemia juveniles and adults are used as a nursery diet not only for their optimal nutritional value but also for energetic advantages as well. For example, when offered large Artemia instead of freshly-hatched nauplii, the predator larvae need to chase and ingest less prey organisms per unit of time to meet their food requirements. This improved energy balance may result in a better growth, a faster developmental rate, and/or an improved physiological condition as has been demonstrated in lobster, shrimp, mahi-mahi, halibut and Lates larviculture. For the latter species, the introduction of ongrown Artemia as a hatchery/nursery food resulted in significant savings of Artemia cysts of up to 60% and consequently a significant reduction in the total larval feed cost. In the early larviculture of lobster, Homarus spp., feeding biomass instead of nauplii has proven to reduce cannibalism adequately. Table 4.4.2. Profile of fatty acids (in mg.g-1 DW) and amino acids (ing. 100g-1 DW) in Great Salt Lake preadults cultured under flow-through conditions on a diet of corn and soybean powder compared to nauplii (After Léger et al., and Abelin, unpubl. data). Until recently, applications with ongrown Artemia were never taken up at an industrial level because of the limited availability of live or frozen biomass, its high cost and variable quality. Technologies developed in the eighties for establishing intensive pond and super-intensive tank production systems of brine shrimp in or near the aquaculture farm have resulted in increased interest for Artemia biomass during the last decade. In China, several thousand tons of Artemia biomass have been collected from the Bohai Bay salt ponds and used in the local hatcheries and grow-out facilities for Chinese white shrimp, Penaeus chinensis. In addition, the aquarium pet shop industry offers good marketing opportunities for live Artemia biomass produced in regional culture systems. Today, over 95% of the more than 3000 metric tons of Artemia biomass that are marketed in this sector are sold frozen since they are harvested from a restricted number of natural sources and live transportation to other continents is cost prohibitive. Singapore, for example, already experiences a bottleneck where the local tropical aquarium industry is threatened by a shortage of live foods. · quality of the Artemia can be better controlled (i.e. nutritionally, free from diseases). Super-intensive culture techniques offer two main advantages compared to pond production techniques. Firstly, there is no restriction with regard to production site or time: the culture procedure not requiring high saline waters nor specific climatological conditions. Secondly, the controlled production can be performed with very high densities of brine shrimp, up to several thousand animals per liter versus a maximum of a few hundred animals per litre in outdoor culture ponds. As a consequence, very high production yields per volume of culture medium can be obtained with tank-based rearing systems. In the last decade several super-intensive Artemia farms have been established, including the USA, France, UK and Australia, so as to supply local demands. Depending on the selected culture technology and site facilities, production costs are estimated to be 2.5 to 12 US$.kg-1 live weight Artemia with wholesale prices varying from $25 to $100.kg-1. In practice, when setting up an Artemia culture one should start by making an inventory of prevailing culture conditions and available infrastructure. Although Artemia in its natural environment is only occurring in high-salinity waters (mostly above 100 g.l-1), brine shrimp do thrive in natural seawater. In fact, as outlined earlier (see under 4.1. ), the lower limit of salinity at which they are found in nature is defined by the upper limit of salinity tolerance of local predators. Nonetheless their best physiological performance, in terms of growth rate and food conversion efficiency is at much lower salinity levels, (i.e. from 32 g.l-1 up to 65 g.l-1). For culturing Artemia, the use of natural seawater of 35 g.l-1 is the most practical. Small adjustments of salinity can be carried out by adding brine or diluting with tap water free from high levels of chlorine. However, one should avoid direct addition of sea salt to the culture so as to prevent that undissolved salt remains in the tanks, and should keep a stock of brine for raising the salinity as required. Apart from natural seawater or diluted brine, several artificial media with different ionic compositions have been used with success in indoor installations for brine shrimp production. Although the production of artificial seawater is expensive and labour-intensive it may be cost-effective under specific conditions. Examples of the composition of such media are given in Table 4.4.3. In some instances, the growth of Artemia is even better in these culture media than in natural seawater. Furthermore, it is not even essential to use complex formulas since Dietrich and Kalle (a media prepared with only ten technical salts) have proved to be as good as complete artificial formulas. Moreover, culture tests with GSL Artemia in modified ARC seawater (Table 4.4.3.) showed that KCl can be eliminated, and MgCl2 and MgSO4 can be reduced without affecting production characteristics. Calcium concentrations higher than 20 ppm are essential for chloride-habitat Artemia populations whereas carbonate-habitat strains prefer Ca2+ concentrations lower than 10 ppm in combination with low levels of Mg2+. Since ionic composition is so important, concentrated brine (not higher than 150 g.l-1) from salinas can also be transported to the culture facilities and diluted with fresh water prior to its use. For most strains a common range of preference is 19-25°C (see also Table 4.4.4.). It follows that temperature must be maintained between the specific optimal levels of the selected Artemia strain. Several methods for heating seawater are discussed below (4.4.2.4 Heating). According to published information, it is generally accepted that the pH tolerance for Artemia ranges from 6.5 to 8. The pH tends to decrease during the culture period as a result of denitrification processes. However, when the pH falls below 7.5 small amounts of NaHCO3 (technical grade) should be added in order to increase the buffer capacity of the culture water. The pH is commonly measured using a calibrated electrode or with simple analytic lab kits. In the latter case read the instructions carefully in order to make sure whether the employed reaction is compatible with seawater. With regard to oxygen, only very low concentrations of less than 2 mg O2.l-1 will limit the production of biomass. For optimal production, however, O2-concentrations higher than 2.5 mg.l-1 are suggested. Maintaining oxygen levels continuously higher than 5 mg.l-1, on the other hand, will result in the production of pale animals (low in the respiratory pigment: haemoglobin), possibly with a lower individual dry weight, which may therefore be less perceptible and attractive for the predators. Table 4.4.3. Artificial seawater formulations used for tank production of Artemia (ing.l-1). For the Dietrich and Kalle formulation, solutions A and B are prepared separately, then mixed and strongly aerated for 24h. A dark red colouration (high haemoglobin content) is easily obtained by applying regular but short (few minutes) oxygen stresses (by switching off the aeration) a few days before harvesting. Oxygen levels should be checked regularly as they may drop significantly, especially after feeding. Oxygen is conveniently measured with a portable oxygen electrode. When oxygen occasionally drops below 30% saturation (i.e. 2.5 mg O2.l-1 in seawater of 32 g.l-1 salinity at 27°C), aeration intensity should be increased temporarily or air stones added. If oxygen levels remain low, the aeration capacity should be increased. Remember that for a given air flow, the oxygen level is more effectively increased by small air bubbles compared to big ones. Too small air bubbles, on the other hand, may get trapped between the thoracopods and skim off the animals to the surface. The quality of the culture medium is first affected by excess particles as well as by soluble waste products such as nitrogen compounds. High levels of suspended solids will affect production characteristics, either by their interference with uptake of food particles and propulsion by Artemia, or by inducing bacterial growth that will compete for oxygen and eventually infest the culture tank. Harmful particle levels are not determined since no practical method for their measurement has been developed. However, problems caused by excess particles can be detected through the microscopic observation of the animals: thoracopods should be unclogged, and the gut should be uniformly filled and unobstructed. With some experience, acceptable particle load can be estimated on sight by holding up an aliquot of the culture in a transparent beaker against a light source. Soluble waste products give rise to toxic nitrogen-compounds (e.g. NH3-N, NO2 - N, NO3 - N). Levels of nitrogen components can be measured with appropriate lab kits (make sure to use seawater adapted versions). The tolerance levels in Artemia for ammonia, respectively nitrite and nitrate in acute and chronic toxicity tests with, for instance, GSL brine shrimp larvae showed no significant effect on survival (LC50) nor growth for concentrations up to 1000 mg.l-1 NH4+, respectively 320 mg.l-1 NO2 - N. It is therefore very unlikely that N-components will interfere directly with the Artemia cultures. Nevertheless the presence of soluble substances should be restricted as much as possible since they are an ideal substrate for bacteria. Excess soluble waste products can only be eliminated by diluting the culture water with clean water, be it new or recycled. Methods to evacuate loaded culture water are discussed below. Unlike other crustaceans, Artemia can be cultured at high to very high densities without affecting survival. Depending on the applied culture technique, inoculation densities up to 5,000 larvae per litre for batch culture, 10,000 for closed flow-through culture, and 18,000 for open flow-through culture can be maintained without interference on survival (Table 4.4.5.). Maximum densities cause no real interference on behaviour. Of course, each culture has its maximum carrying capacity: above these densities, culture conditions become suboptimal (water quality deterioration, lower individual food availability) and growth and survival decrease (see also Table 4.4.9.). In contrast to survival, crowding seems to affect ingestion rate and therefore growth. In stagnant systems, a clear decrease of the growth rate with increasing animal density was observed, since the preservation of the water quality compels us to a relatively lower individual feeding rate at high animal densities. The cost-effectiveness of a culture obviously increases with increasing Artemia density. In an open flow-through system, maximal densities will be limited by feeding rate while in recirculating and stagnant system the preservation of water quality will determine a safe feeding level, which in turn determines the animal density at which the individual feed amount still allows a satisfactory growth rate. Table 4.4.5. Animal densities employed under different culture conditions. After some culture trials with increasing animal densities, the maximal density can be identified as the highest possible density where no growth inhibition occurs. Artemia is a continuous, non-selective, particle-filtration feeder. Various factors may influence the feeding behavior of Artemia by affecting the filtration rate, ingestion rate and/or assimilation: including the quality and quantity of the food offered, the developmental stage of the larvae, and the culture conditions. More detailed information concerning these processes are given in Coutteau & Sorgeloos (1989). Artemia can take up and digest exogenous microflora as part of the diet. Bacteria and protozoans which develop easily in the Artemia cultures are able to biosynthesize essential nutrients as they use the supplied brine shrimp food as a substrate; in this way they compensate for any possible deficiencies in the diets composition. Micro-algae: undoubtedly yield best culture results but rarely available in sufficient amounts at a reasonable cost. As such the mass culture of suitable algae for Artemia is not economically realistic, so their use can only be considered in those places where the algal production is an additional feature of the main activity. Moreover, not all species of unicellular algae are considered suitable for sustaining Artemia growth (dAgostino, 1980). For example, Chlorella and Stichococcus have a thick cell wall that cannot be digested by Artemia, Coccochloris produces gelatinous substances that interfere with food uptake, and some dinoflagellates produce toxic substances. Normally, a constant supply of a rather concentrated algal effluent is required to sustain an intensive Artemia culture. At low algal concentrations, either Artemia density must be lowered thus reducing productivity, or the flow rate must be high and thus increasing pumping and heating costs. If a suitable algal supply exists, it is most conveniently applied in an open flow-through system. Flow rates are monitored as to maintain optimal feed levels in the culture tank (see further: Feeding Strategy). Tobias et al. (1980) suggested a 2-phase culture on algal effluents, based on the increase in filter efficiency of Artemia synchronous with its development. In the first part of this cascade system, juvenile Artemia are grown at a very high density on the concentrated effluent. The culture water effluent, that is still containing algae but at a lower concentration, is directed to a second culture tank where adult Artemia, stocked at lower densities, are able to remove the algae remains. Dried algae: in most cases algal meals give satisfactory growth performance, especially when water quality conditions are kept optimal. Drawbacks in the use of these feeds are their high cost (>12 US $.kg-1), as well as their high fraction of water soluble components which cannot be ingested by the brine shrimp but which interfere with the water quality of the culture medium. The highly variable production yields, which often occur when feeding a yeast mono-diet, are usually due to the nutritional deficiencies of the yeast diet and should therefore be compensated by supplementation with other ingredient sources. For certain SCP, digestibility by the Artemia can also be a problem. For example, the complete removal of the complex and thick yeast cell wall by enzymatic treatment and/or supplementation of the diet with live algae significantly improved assimilation rate and growth rate of the brine shrimp (Coutteau et al., 1992). Waste products from the food industry: non-soluble waste products from agricultural crops or from the food-processing industry (e.g. rice bran, corn bran, soybean pellets, lactoserum) appear to be a very suitable feed source for the high-density culture of Artemia (Dobbeleir et al., 1980). The main advantages of these products are their low cost and universal global availability. Equally important in the evaluation of dry food is the consistency of the food quality and supply, and the possibility for storage without loss of quality. It follows therefore that bulk products must be stored in a dry and preferentially cool place. In most cases, commercially available feeds do not meet the particle size requirements and further treatment is needed. When man-power is cheap a manual preparation can be used to obtain feed particles in the 50-60 µm size range. It consists of a wet homogenization in seawater (using an electrical blender) followed by the squeezing of the suspension through a 50 µm filter bag. Since the feed suspension obtained cannot be stored, this manual method can only be used on a day-to-day basis for feed processing. Furthermore, this manual processing method is not very effective with products high in fibre such as e.g. rice bran, where as much as 90% of the product may be discarded. In order to reduce the manual labour required in preparing the food, mechanical techniques for dry grinding and processing need to be used. In several cases, sophisticated and therefore expensive equipment is required, (i.e. micronisation grinding) which restricts its practical use and cost-effectiveness. Soluble material is not taken up by Artemia and will be decomposed in the culture medium by bacteria, thereby deteriorating water quality via a gradual build up of toxic substances such as ammonia and nitrite. Hence feeds which contain high amounts of soluble proteins (e.g. soybean meal) should be treated prior to their use in order to reduce the soluble fraction. This can easily be achieved by strongly aerating the feed suspension with airstones for 1-2 h and then allowing the feed particles to settle by cutting off the aeration for another half an hour. Dissolved materials will foam off or remain in the water fraction which can be drained off from the sedimented particles. This washing procedure can be repeated until most soluble matter is removed. Since Artemia is a continuous filter-feeding organism, highest growth and minimal deposition of unconsumed food is achieved when food is distributed as frequently as possible. When feeding Single-Cell Proteins, algal or yeast concentrations should be maintained above the critical minimum uptake concentration which is specific for the algal species and the developmental stage of Artemia (Abreu-Grobois et al., 1991). Using bakers yeast, Coutteau & Sorgeloos (1989) observed a severe decrease of the limiting uptake level from 500 cells/µl for 2-day old Artemia to 100 cells/µl for Artemia older than one week. Conversion to Dunaliella cells can be obtained using a commonly accepted ratio of 3 yeast cells per Dunaliella cell. Although nutritional properties seem to affect the ingestion process, a fair approximation of minimal concentrations of other algae species can be extrapolated using simple volumetric ratios. Since Artemia has a high clearance rate of micro-algae, the algal concentration in the culture tank should be determined several times a day and the retention time adjusted so as to maintain levels well above the estimated minimal uptake concentration. If you have no data on ingestion rate or optimal feed levels, you can try out different algal concentrations and estimate feeding level by microscopical observation. Well-fed animals have a completely filled gut and release compact faecal pellets. Underfed animals have an empty or barely filled gut and tend to release loose faecal pellets. Levels of dry feeds, consisting of fragments and irregular particles, cannot be counted in the culture tank. 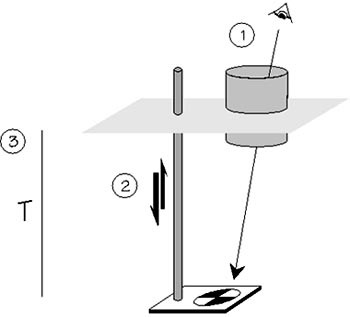 Therefore a correlation between optimal feed level and transparency of the culture water has been developed: the feed concentration in a culture tank is commonly determined by measuring the transparency of the water with a simplified Secchi-disc (see Fig. 4.4.1.). The turbidistick is slowly submerged in the water until the contrast between the dark and light areas has disappeared. The transparency is read as the depth of submersion of the stick (in cm). This measurement is evidently subject to some individual variance. If several people are involved in the maintenance of the culture, some prior harmonization of the reading of the turbidistick is recommended. 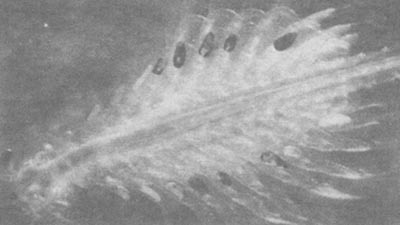 Experience learned that optimal feed levels coincide with transparencies of 15 to 20 cm during the first culture week and 20 to 25 cm the following week (Lavens et al., 1986). Once animals reach the adult stage, best production yields are obtained when gradually switching from a transparency-controlled food distribution to a feeding scheme of about 10% dry feed weight of the live weight Artemia per litre per day (Lavens & Sorgeloos, 1987). A feeding scheme is given in worksheet 4.4.1. Figure 4.4.1. Feeding strategy with dry food. 1. Look through looking glass to turbidistick 2. Submerge turbidistick until contrast between black and white disappear. 3. Read depth of submergence in centimeter (=T). Artemia can be reared in containers of any possible shape as long as the installed aeration ensures proper oxygenation and adequate mixing of feed and animals throughout the total culture volume. However, aeration should not be too strong. Thus, aeration and tank design must be considered together as the circulation pattern is determined by the combination of both. A wide variety of different culture tanks has proven to be suitable. For cultures up to 1 m3, rectangular tanks are the most convenient. They can be aerated either with an air-water-lift (AWL, see Fig. 4.4.2.) system (Fig. 4.4.3), by an aeration collar mounted around a central standpipe (Fig. 4.4.4), or by perforated PVC tubes fixed to the bottom of the tank. For larger volumes (>1 m3), it is advantageous to switch to cement tanks lined on the inside with impermeable plastic sheets or coated with special paint. These large tanks are traditionally operated as raceway systems. They are oblong, approximately 1.5 m wide and with a height/width ratio kept close to 1:2 (see Fig. 4.4.3.). The length is then chosen according to the desired volume. The corners of the tank may be curved to prevent dead zones where sedimentation can take place. A central partition, to which AWLs are fixed, is installed in the middle of the tank and assures a combined horizontal and vertical movement of the water which results in a screw-like flow pattern (Bossuyt and Sorgeloos, 1980). If axial blowers are used for aeration, the water depth should not exceed 1.2 m to assure optimal water circulation. Figure 4.4.2. Detail of an air-water-lift. Figure 4.4.3. Schematic views and dimensions (in cm) of raceway systems for Artemia culturing (modified from Bossuyt and Sorgeloos, 1980). The most important and critical equipment in flow-through culturing is the filter used for efficient evacuation of excess culture water and metabolites without losing the brine shrimp from the culture tank. These filter units should be able to operate without clogging for at least 24 h in order to reduce risks of overflowing. Initially, filters were constructed as a PVC-frame around which an interchangeable nylon screen was fixed. The aeration was positioned at the bottom of the filter and ensured a continuous friction of air bubbles against the sides of the filter screen, which resulted in an efficient reduction of filter-mesh clogging (see Fig. 4.4.4.). The upper part of the filter bag positioned just above and underneath the water level was made of smooth nylon cloth or plastic as to prevent any trapping of the brine shrimp that are foamed off by the effect of the aeration collar. Later, a new type of cylindrical filter system (Fig. 4.4.5.) was introduced. It consists of a welded-wedge screen cylinder, made of stainless steel, that is vertically placed in the center of the culture tank (Fig. 4.4.6.). The base is closed by a PVC-ring and bears a flexible tube for the evacuation of the effluent. An aeration collar is fixed to the lower end of the filter. Figure 4.4.4. 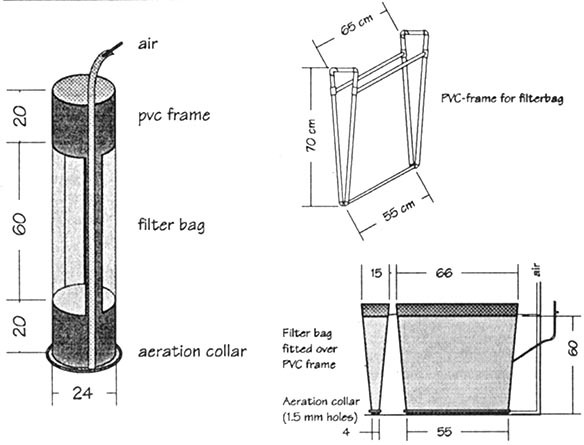 Schematic views and dimensions of filter systems used in flow-through culturing of Artemia (modified from Brisset et al., 1982). Figure 4.4.6. Schematic view of a 1000 l open flow-through system (modified from Dhert et al, 1992). · possible contact points between particles and filter are reduced to two instead of four mesh borders, which consequently reduces clogging probability. This filter can be operated autonomously for much longer periods than traditional nylon mesh-filters. Therefore, proportionally smaller welded-wedge filters can be used, leaving more volume for the animals in the culture tank. Furthermore, they are cost-effective since they do not wear out. As brine shrimp grow, the filter is regularly switched for one with a larger mesh- or slit-openings in order to achieve a maximal evacuation of molts, faeces and other waste particles from the culture tanks. Before changing to a larger mesh check whether animals can cross the larger mesh. If so it is still too early and the actual filter is returned after cleaning. A set of filters covering a 14-day culture period should consist of approximately six different slit/mesh-openings ranging from 120 µm to 550 µm (Table 4.4.6.). Table 4.4.6. Example of food and water renewal management in a 300 l super-intensive Artemia culture (data compiled from Lavens & Sorgeloos, 1991). If the water circulation in the culture tank is correct, the filter may be positioned anywhere in the tank. In cylindrical tanks, especially with conical bottoms, the filter is ideally placed in the center. When ambient temperature is below optimal culture values (25-28°C), heating is imperative. Small volumes (<1 m3) are most conveniently heated using electric thermo-regulated resistors. Depending on the ambient temperature a capacity up to 1000 W.m-3 must be provided. For larger volumes, a heat exchanger consisting of a thermostatic-controlled boiler with copper tubing under or on the bottom of the culture tank is recommended. Heat losses can be avoided by insulating the tanks with styrofoam and covering the surface with plastic sheets. Dry feeds can not be distributed as such to the culture tank, and therefore need to be mixed in tap or seawater beforehand. The feed suspension is distributed to the culture tanks via a timer-controlled pump (Fig. 4.4.7.). The volume of the food tank should be large enough to hold the highest daily food ration at a maximum concentration of 200 g food.l-1. Even at these concentrations, the food suspension is so thick that the risk for clogging of the food lines is quite high. It follows therefore that care must be taken that the lowest point of the feed lines is beyond the pump so that food that settles during intervals between feeding does not need to pass through the pump when activated. If some distance exists between the pump and the culture tank an air-inlet just behind the pump will continually blow all food out of the feed lines, towards the culture tank. Depending upon the objectives and the opportunities, different culture procedures for super-intensive Artemia production may be applied. The final selection of one or other type of installation will be subject to local conditions, production needs and investment possibilities. However, two basic options are: should water be renewed (open flow-through) or not. Furthermore, in the latter case, should a particular water treatment be applied (closed flow-through) or not (stagnant or batch system). Obviously there are all kinds of transition types ranging from open flow-through with 0% recirculation to closed flow-through with 100% recirculation. In reality, even at complete recirculation, a small part of the culture water must be regularly renewed. The culture system should be designed in such a way that the water quality can be maintained as optimal as possible. This means that the concentration of particles and soluble metabolites should remain minimal as to prevent toxicity problems, proliferation of micro-organisms and interferences with the filter-feeding apparatus of the brine shrimp. It is obvious that a discontinuous or continuous renewal of culture water by clean seawater, with consequent dilution of particulate and dissolved metabolites, will result in the best possible culture conditions and highest production capacities. Application of an open flow-through culture technique, however, is limited to those situations where large volumes of sufficiently warm seawater (or brine) are available at relatively low cost or where large quantities of algal food are available, (i.e. effluents from artificial upwelling projects, tertiary treatment systems, intensive shrimp grow-out ponds etc.). If such a condition is not fulfilled, partial recirculation through a water treatment unit is indispensable (see further). The effluent filter forms a crucial component as described previously. The water retention time is chosen so as to reach an optimal compromise between efficient evacuation of waste water and minimal food losses. An optimal flow-rate regime applied for a 300 l rectangular tank equipped with welded-wedge filters (65 cm high by 14 cm in diameter) is outlined in Table 4.4.6. The adjustment of the flow rate can be accomplished by using interchangeable PVC-caps which fit onto the PVC water supply pipe connected to a constant head tower. When calibrated, a series of caps with increasing number of perforations enables the operator to maintain a pre-set flow rate; this has proven to be much more practical than adjusting the valves. A very simple semi flow-through system has been developed by Dhert et al. (1992). The system does not require the use of feeding pumps and involves minimal care. The pilot system consists of six oval raceway tanks of 1 m3 (see above) and six reservoir tanks of the same capacity placed above each culture tank (Fig. 4.4.6.). Those reservoir tanks hold seawater and food (squeezed rice bran suspension), and need manual refilling only once or twice a day. They are slowly drained to the culture tanks. Flow rate is easily adjusted by means of a siphon of a selected diameter. Retention time is at least 12 h. The culture effluent is drained using welded-wedge filters as described above. This technique involves minimal sophistication and appears to be very predictable in production yields which are between those obtained in batch and flow-through systems (see 4.4.2.9. Production figures). When only limited quantities of warm seawater are available, open flow-through systems cannot be considered. Yet, if one decides to culture at high animal densities and/or for prolonged culture periods, the accumulation of particles and soluble metabolites will reduce the water quality until good culture practices become impossible. Under these conditions, the high-density flow-through culturing of Artemia can be maintained only by recirculating the culture water over a water treatment unit. This unit should be designed to remove particles and decrease levels of harmful nitrogen components. Even though there have been significant research efforts to develop performing recirculation systems, the operation of practical recirculating systems for Artemia is still more an art than a science. That is why we will not recommend one specific recirculation technology. Figure 4.4.8. should therefore be considered as one example of an operational recirculating system for Artemia culture, as was developed at the Artemia Reference Center. The effluent is drained from the culture tanks using filters described above. Largest flocks are removed from the effluent in a small decantation tank. The effluent is then treated in a rotating biological contactor. In this rotating biological contactor (RBC) or biodisc, nitrogen compounds from soluble organic products are broken down via oxidative deamination and nitrification into nitrate. Biodisc purification has been selected for our pilot installation because of its stable operation under conditions of fluctuating hydraulic and organic loadings. It consists of sand-blasted or corrugated PVC discs (diameter 100 cm) which rotate for 1/3 submerged at 6 rpm. Total effective surface for bacterial growth is 190 m2 which is more than sufficient for the purification of 1800 l of culture water with an organic load of about 30 mg.l-1 BOD5. As an alternative to the biodisc, a trickling filter may be used. Figure 4.4.8. Schematic diagram of a closed flow-through system for culturing Artemia. (1) fresh seawater addition; (2) drain of water and of (3) suspended solids (modified from Lavens et al., 1986). The biodisc effluent is pumped over a cross-flow sieve (200 cm2) with a slit-opening of 150 µm (Fig. 4.4.9.). The effluent cascades over the inclined sieve at high speed, pushing particles and flocks downwards while an important part of the water is evacuated through the sieve. The use of a well designed cross-flow sieve can drastically reduce the volume of the effluent (up to 50%) calling for much smaller dimensions of the subsequent plate separator. The concentrated sludge is subsequently drained to a plate separator (Fig. 4.4.10. ), while water collected through the cross-flow sieve is directly returned to the reservoir. In this way the volume of the plate separator could be reduced to 650 l. It consists of an inclined tank subdivided into a small inflow and a large settling compartment where parallel sand blasted or corrugated PVC-plates are mounted in an inclined position (60°). Figure 4.4.9. Cross-flow sieve system for concentrating suspended particles from Artemia culture effluent (modified from Bossuyt and Sorgeloos, 1980). Figure 4.4.10. 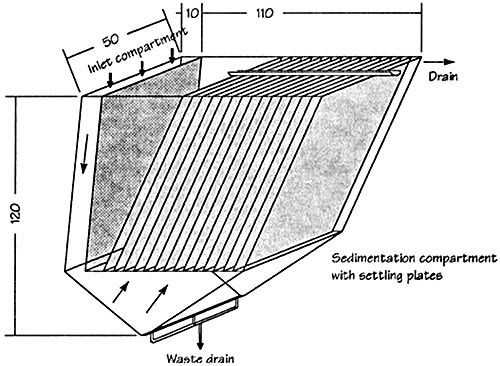 Schematic view and dimension (cm) of a plate separator (650 l) used for primary treatment of a 2 m3 Artemia raceway (modified from Sorgeloos et al., 1986). In the settling compartment the effluent rises slowly enough to enable particles to settle on the plates. A drain fixed on top of the plates finally evacuates the clean water to the stock tank. Optimal retention times of 20 minutes assure maximal sedimentation of the waste particles. Once every 2 to 3 days recirculation is interrupted and the plates vigorously shaken. The accumulated sludge should be drained by siphoning from the bottom of the tank. A last step in the purification process may be disinfection by U.V. radiation, but, there is no absolute proof of its effectiveness in the culture of Artemia nor does it result in a completely sterile medium. The treated water is pumped in a constant-head tower and returned to the culture tanks (Fig. 4.4.8.). At regular time intervals part of the water should be renewed. In our system we apply an arbitrarily chosen 25% water exchange on a weekly basis. Using this recirculation system for an Artemia culture unit of six 300 l tanks, water quality can be maintained at acceptable levels (i.e. the biological and mechanical treatments result in an effluent containing less than 5 ml.l-1 TOC, which accounts for a removal percentage of more than 80%). The levels for NH4+ -N and NO2 - N remain below 10.9 mg.l-1 and 0.6 mg.l-1, respectively, which is far below the tolerance limits for Artemia. Levels for suspended solids do not exceed 380 mg.l-1 (Lavens & Sorgeloos, 1991). When culturing at lower intensity (5 animals.ml-1) or for shorter periods (14 days) a less complex treatment unit is required. As an example, a 2000 l, air-water-lift operated raceway has proven to be very serviceable. With the exception of the water exchange, the same culture conditions can be maintained as described for the flow-through system. However, automation is more difficult, and monitoring, especially with regard to feeding conditions, more critical. The first days of culture do not present any problem and optimal feeding levels can easily be maintained. From the fourth day onwards the water quality deteriorates quickly and waste particles e.g., faecal pellets, food aggregates, and exuviae, physically hamper food uptake by the Artemia and interfere with the transparency measurements. The solution is to install a primary treatment unit such as a plate separator (see above) connected to the raceway. This also implies the use of filters to retain the Artemia in the culture tanks. Clogging of these filters is less problematic here than in flow-through culturing since no extra water is added and there are no overflow risks. Flow rates and plate separator dimensions are a function of the volume of the raceway; optimal particle removal is assured when the medium passes over the plate separator at least eight times a day. Apart from the elimination of particulate wastes, it may also be desirable to partially remove the soluble fraction from the culture medium, especially when feeding products that are rich in proteins or which contain a high fraction of soluble material. An easy technique to incorporate in the batch culture design is foam fractioning. A schematic drawing of a foam tower for the final treatment of the effluent of a 2 m3 raceway is provided in Fig. 4.4.11. Figure 4.4.11. Schematic diagram of a foam separator (modified from Sorgeloos et al., 1986). Although the advantages of using preys with a gradual increasing size are fully recognized, the complexity and additional costs of growing Artemia as compared to nauplii may be in many cases prohibitive. Therefore, a simplified but reliable technique for the short-term intensive culture of Artemia juveniles for use as a nursery diet for fish and shrimp was developed at the ARC. The idea was to develop a flexible culture procedure, covering the production of Artemia of specific sizes up to 3 mm. Again their nutritional value can easily be improved through simple enrichment techniques. In fact, higher (n-3) HUFA levels are obtained than for nauplii enrichment. Cultures were performed either in 100 l or in 500 l rectangular polyethylene tanks. Aeration is ensured by four perforated PVC tubes fixed to the bottom. Cysts are hatched, counted and transferred to the culture tanks at 5, 10, 15, 20 and 50 animals.ml-1 depending on the desired growth rate (Figure 4.4.12.). The culture period is arbitrarily limited to 7 days. The animals are fed micronized soybean and pea. The feed is mixed daily in tap water and distributed semi-continuously to the culture. Daily feed ratios are chosen so as to keep the transparency of the culture water between 15 and 20 cm. A directive feeding regime was established (Table 4.4.7.) but, nevertheless, each culture requires constant adjustment of the ratios according to the prevailing transparency. Figure 4.4.12. Growth curves of Artemia cultured under batch conditions: 5 animals.ml-1 (o), 10 animals. ml-1 (G), 15 animals. ml-1 (Î) and 20 animals.ml-1 (à)(from Dhont et al., 1993). Table 4.4.7. Directive feeding regime with soybean and pea for a culture of 10 animals.ml-1 (g.m-3 culture volume) and enrichment ratios added daily to the food suspension (mg DRY SELCO.1-1 culture volume) (data compiled from Dhont et al., 1993). Artemia juveniles can be enriched in the same way as nauplii (see above), but, due to the higher filtration efficiency, this results in higher (n-3) HUFA levels in much shorter enrichment periods (1 - 4h) (Table 4.4.8.). It is furthermore assumed that these short enrichment periods may result in higher final DHA/EPA ratios in the biomass compared to nauplii when boosted with high-DHA emulsions, since there is insufficient time to break down the DHA as is the case in nauplii. There is however, an alternative method that takes profit of the specific aspects of ongrown Artemia: instead of adding the enrichment emulsion at the end of the culture, it is distributed during the culture. This way we take advantage of the feeding behaviour of brine shrimp. The essential fatty acids will not only be ingested but will be incorporated in the body tissue as well. Daily increasing doses of DRY SELCO (INVE Aquaculture NV, Belgium) are added to the food suspension so that total DRY SELCO ratio equalled 0.6 g.l-1 (analogous to short term enrichment of nauplii) by the end of the culture (Table 4.4.7.). This method has several advantages: (n-3) HUFA levels can be five times higher than when the same amount is given in one ration after 7 days (Table 4.4.8. ); the risk for acute oxygen drops is avoided and Artemia that are harvested before the end of the culture are already partially enriched. Occasionally heavy losses of preadults are faced due to infections with filamentous Leucothrix bacteria which occur especially in nutrient-rich media. The Leucothrix colonies fix on the exoskeleton, by preference on the thoracopods, and become only visible from the instar V/VI-stage onwards. The brine shrimp suffer physically, as the movements of their thoracopods become affected and filtration rates consequently are reduced. Eventually, growth and molting are arrested, overfeeding of the tanks occurs, resulting in collapse of the Artemia culture. A cure may be the application of terramycin, however, antibiotics cannot be used in recirculation systems as they will affect the biological treatment unit. The most practical solution appears to be a raise in salinity from 35 to 50-60 g.l-1 together with a higher water renewal rate. A second observed disease in Artemia cultures is the so-called black disease;where part of the animals show black spots especially at their extremities, i.e. thoracopods, antennae (Fig. 4.4.13). This disease consists of the detachment of the epidermis from the cuticula, and is caused by a dietary deficiency which interferes with lipid metabolism. In high density culturing of Artemia using agricultural by-products as a food source, the black disease is observed when water quality deteriorates (probably interfering with the composition of the bacterial population and consequently the diet composition) and/or when feeding rates are not optimal. Improving these conditions does not save the affected animals but appears to avoid further losses. Figure 4.4.13. Artemia showing black spot disease on the thoracopods. Harvesting of high-density cultures of Artemia can be facilitated by taking advantage of the surface respiration behaviour of the animals. When the aeration in the culture tank together with the flow-through and the automatic feeding are interrupted, oxygen levels in the water drop very fast and all waste particles sink to the bottom; after about 30 minutes the Artemia respond to the oxygen depletion by concentrating at the water surface where they perform surface respiration. The concentrated population, free from suspended solids, can easily be scooped out with a net of an appropriate mesh size. When the culture water is not loaded with particles, brine shrimp can be harvested by draining the complete culture over a sieve which should be partially submerged. The Artemia should be thoroughly washed preferentially in freshwater or otherwise in seawater. The harvested Artemia can then be offered as a most suitable live food for freshwater as well as marine predators. The salinity of the predator culture water is of no concern, as Artemia is a hypo-osmoregulator, (i.e. its body fluids have a constant and low salt content of about 9 g.l-1). In seawater, they remain alive without feeding for several days. When transferred into freshwater Artemia will continue to swim for another 5 h after which time they eventually die as a result of osmoregulatory stress. Transportation of live brine shrimp can be carried out in plastic bags containing cooled seawater and oxygen. Harvested Artemia which are not directly consumed can be frozen or dried in flakes. In order to ensure optimal product quality, brine shrimp biomass must be frozen immediately after thorough washing with fresh water when still alive. The biomass should be spread out in thin layers (1 cm) in plastic bags or in ice trays and be transferred to a quick freezer (at least -25°C). The adults exoskeleton is not damaged when the biomass is properly frozen. Upon thawing, the Artemia cubes yield intact animals which do not pollute the water by the leaching of body fluids (See also 4.5.7.1). Figure 4.4.14. provides a summary of average production data expressed as Artemia survival and length, obtained in the different culture systems described in this chapter. After two weeks of culturing, preadult or adult Artemia with an average length of 5 mm or more can be harvested. Under flow-through culture there is a slight but continuous mortality during the whole of the culture period; no significant differences in survival are noticed between open or closed (with recirculation of the culture medium) flow-through cultures. In stagnant culture installations, on the other hand, there is a significantly higher mortality during the end of the first culture week that can be explained by the deterioration of the water quality, probably because the early naupliar stages are more sensitive than the juvenile or preadult stages. Average production yields in terms of wet weight biomass harvested after two weeks culture amount to 5 kg, 15 kg and 25 kg live weight Artemia per cubic metre of tank volume, respectively for batch production, flow-through systems using micronized feeds, and live algae. These differences in production figures are mainly the result of differences in maximum stocking density at the start and final survival at the end of the culture trial (Table 4.4.9). It is not evident to estimate production costs for Artemia culturing. While fixed costs can be fairly well generalized, operational costs are entirely dependent on local conditions. For instance, local conditions already determine what kind of operation is advisable: open flow-through in regions with abundant clean and warm sea water; but important additional costs are involved when a recirculating unit is necessary. Food should be selected among locally available products. Not only its price but also its processing price is crucial in food selection. Furthermore, it should be micronized mechanically or squeezed through a filter bag manually will again depend on micronization cost compared to local labour cost. Finally, heating and pumping costs are set by diverse local parameters such as electricity costs, ambient temperature, location of seawater stock vis-a-vis culture tanks, etc..
Table 4.4.9. Production characteristics of Great Salt Lake Artemia cultures at different animal densities at start of culture. Abreu-Grobois, F.A., Briseno-Dueñas, R.,. Herrera, M.A and Malagon, M.L. 1991. A model for growth of Artemia franciscana based on food ration-dependent gross growth efficiencies. Hydrobiologia 212: 27-37. Bossuyt E., and Sorgeloos, P. 1980. Technological aspects of the batch culturing of Artemia in high densities. In: The Brine Shrimp Artemia. Vol. 3. Ecology, Culturing, Use in Aquaculture. G. Persoone, P. Sorgeloos, O. Roels and E. Jaspers (Eds). Universa Press, Wetteren, Belgium, pp 133-152. Brisset P.J., Versichele, D., Bossuyt, E., De Ruyck, L. and Sorgeloos, P. 1982. High density flow-through culturing of brine shrimp Artemia on inert feeds - Preliminary results with a modified culture system. Aquacultural Engineering 1(2): 115-119. Coutteau P., Brendonck, L., Lavens, P. and Sorgeloos, P. 1992. The use of manipulated bakers yeast as an algal substitute for the laboratory culture of Anostraca. Hydrobiologia 234: 25-32. Coutteau P., and Sorgeloos, P. 1989. Feeding of the brine shrimp Artemia on yeast: effect of mechanical disturbance, animal density, water quality and light intensity. In: European Aquaculture Society Spec. Publ. N° 10. Bredene, Belgium, 344 pp. DAgostino, A.S. 1980. The vital requirements of Artemia: physiology and nutrition. In: The Brine Shrimp Artemia, Vol. 2, Physiology, Biodiversity, Molecular & Biology. G. Personne, P. Sorgeloos, O. Roels and E. Jaspers (Eds). Universa Press, Wetteren, Belgium, pp 55-82. Dhert P., Bombeo, R.B., Lavens, P. and Sorgeloos, P. 1992. A simple semi flow-through culture technique for the controlled super-intensive production of Artemia juveniles and adults. Aquacultural Engineering 11: 107-119. Dhont J., Lavens, P. and Sorgeloos, P. 1993. Preparation and use of Artemia as food for shrimp and prawn larvae. In: CRC Handbook of Mariculture. 2nd Edition. Vol 1: Crustacean Culture. J.V. Mc Vey (Ed). CRC Press, Inc., Boca Raton, Florida, USA, pp 61-93. Dobbeleir J., N. Adam, E. Bossuyt, E. Bruggeman, and P. Sorgeloos 1980. New aspects of the use of inert diets for high density culturing of brine shrimp. In: The brine Shrimp Artemia. Vol. 3. Ecology, Culturing, Use in Aquaculture. G. Persoone, P. Sorgeloos, O. Roels, and E. Jaspers (Eds). Universa Press, Wetteren, Belgium, pp 165-174. Lavens P., Baert, P., De Meulemeester, A., Van Ballaer, E. and Sorgeloos, P. 1986. New developments in the high density flow-through culturing of brine shrimp Artemia. Journal of the World Mariculture Society 16: 498-508. Lavens P., and Sorgeloos, P. 1987. Design, operation, and potential of a culture system for the continuous production of Artemia nauplii. In: Artemia Research and its Applications. Vol. 3. Ecology, Culturing, Use in Aquaculture P. Sorgeloos, D. Bengtson, W. Decleir and E. Jaspers (Eds) Universa Press, Wetteren, Belgium: 339-345. Lavens P., Léger, P. and Sorgeloos, P. 1989. Manipulation of the fatty acid profile in Artemia offspring produced in intensive culture systems. In:Aquaculture - A biotechnology in progress. N. De Pauw, E. Jaspers, H. Ackefors, N. Wilkins (Eds). European Aquaculture Society, Bredene, Belgium, pp 731-739. Lavens P., and Sorgeloos, P. 1991. Chapter XIII: Production of Artemia in culture tanks. In: Artemia Biology. R.A. Browne, P. Sorgeloos and C.N.A. Trotman (Eds). CRC Press, Inc. Boca Raton, Florida, USA, pp 317-350. Léger P., Bengtson, D.A., Simpson, K.L. and Sorgeloos, P. 1986. The use and nutritional value of Artemia as a food source. Oceanogr. Mar. Biol. Ann. Rev. 24: 521-623. Tobias W.L., Sorgeloos, P., Roels, O.A. and Sharfstein, B.A. 1980. International study on Artemia. XIII. A comparison of production data of 17 geographical strains of Artemia in the St. Croix artificial upwelling mariculture system. In: The brine Shrimp Artemia. Vol. 3. Ecology, Culturing, Use in Aquaculture. G. Persoone, P. Sorgeloos, O. Roels and E. Jaspers (Eds). Universa Press, Wetteren, Belgium, pp 384-392. Vanhaecke P., and Sorgeloos, P. 1989. International study on Artemia. XLVII. The effect of temperature on cyst hatching, larval survival and biomass production for different geographical strains of brine shrimp Artemia spp. Annls Soc. r. zool. Belg 119: 7-23. Worksheet 4.4.1: Feeding strategy for intensive Artemia culture. · T > 20 cm; increase feeding ratio and/or add food manually. · T > 25 cm; increase feeding ratio and/or add food manually. · weigh the filter; WW biomass.l-1 = (total weight - weight empty filter) (volume of sampled culture water)-1.